Every year, on the first Sunday of June, the Archer tournament is held in the old town of Cortona. In Italian its name sounds like «Giostra dell'Archidado». This feast is the main event and the festive final of the week of medieval culture. At the end of May, Cortona gets its medieval look again. Decorated streets of the town get crowded with local residents wearing old outfits precisely reproducing clothes of representatives of different professions and social backgrounds. Various entertainment events are held, including dances, songs, performances of street actors, and the parade of standard-bearers. The medieval festival is impossible without the medieval market where works of old craft are presented. The medieval week includes a number of festive events. The Festival of Margaret who is the Patron Saint of Cotrona is celebrated in May; its date changes depending on the religious calendar. Two picturesque events precede the Festival of St. Margaret, «Colata dei сeri» or Candle Molding, and «Offerta dei ceri» or Candle Tributes. Usually they are held while days off prior to the Archer Tournament. The tradition of candle production and festive tributes of candles dates back to the year of 1325 when wax was very precious. The religious ceremony has been followed by vivid entertainment program with flags and arms since as early as the Middle Ages. The tournament of «Giostra dell'Archidado» is closely connected with the events of 1397 when Cortona celebrated the wedding of Senior Francesco Casali and noble lady Antonia Salimbeni. This match was not only beginning of a new family but also set family relations between powerful families of Cortona and Siena. The wedding was really majestic; and all population of Cortona participated in preparations for the feast. Residents of present-day Cortona hold the colorful tournament to memorize the luxurious wedding. On Sunday representatives of five Cortona districts (Sant'Andrea, Peccioverardi, San Marco, San Vincenzo, Santa Margherita) participate in the Archer Tournament. You can easily tell what district a participant belongs to by his appearance as the color of clothes is the difference mark. The target is placed at the distance of 20 meters from shooters. It is presented by a cube with a 15-centimeter side. The cube is placed in the center of the circle divided into a number of different-color sectors. When you hit some of them you earn a certain number of points. Every participant has two attempts. The winner gets the prize named «Verretta d'Oro». Traditionally the festive week finishes with the medieval dinner. 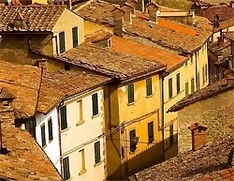 A trip to Cortona is a way to get acquainted with Tuscan history. Cortona has a unique geographical position. The city covers four terraces of Monte Sant` Egidio – the mountainside with almost 500 m slant. No wonder that city image is characterized by narrow and twisting alleys. That’s why it’s better to leave a car before entering the city, you are not likely to find a parking place here and more over it’s more pleasant to start discovering the city without a car. You’ll need a pair of reliable and comfortable shoes to cope with steep ascents in the city.